The Chuuk State Government thru Gov. Wesley Simina and Lt. Gov. Johnson Elimo together with the FSM National Government under Secretary of Health Dr. Vita Skilling in a collaborative effort has confirmed that it has sent two prominent surgeons in the Western Pacific to the prestigious world conference :EHRLICH II –2nd World Conference on Magic Bullets Celebrating the 100th Anniversary of the Nobel Prize Award to Paul Ehrlich, Nürnberg, Germany on October 3-5, 2008. Dr. Julius Caesar “Jojo” Arsenal , a pioneer volunteer of the DAUSA Medical Mission, currently chief surgeon and Dr. Kennedy “Ken” Remit , chief of staff / co-surgeon both based in Chuuk State Hospital were sent to represent the country of FSM wherein they are invited as an oral RESEARCH paper presentor in the said prestigious conference . The research paper they wrote about slingshot injuries “filippin” to the heart in Chuuk were already presented before an audience in the Pacific Basin Medical Association Conference in 2005 and in Pacific Island Surgical Association in 2006. Lately this research paper was presented before the officers , men and women of the USNS MERCY Hospital Ship in “Truk Lagoon “ on August 31, 2008 in which both of them were commended for their humanitarian works under extreme working conditions . The letter of invitation by Professor Dr. Fritz Sorgel , the conference chairman mentioned that to present at this prestigious conference will certainly represent the country before a global audience and it will add new information in serving the country’s needs in treating various diseases . Also the conference commemorates the awarding of the Nobel Prize to Dr. Paul Erhlich one of Germany’s foremost researchers . their motto : Everybody Deserves to Live “ . All of them were admitted at the Surgical Intensive Care Unit in the Surgical Ward of the said Hospital a fter surgery , the first SICU / critical care unit in the FSM that has been existent for the past 8 years now that save a lot of lives. The annual DAUSA Medical Mission in Danao City jointly sponsored by Danao Association USA, Inc., the City Government of Danao City and the Philippine College of Surgeons ended Thursday, September 18, 2008, with a record breaking performance by surgeon volunteers from Cebu Doctors Hospital, led by Dr. Lito Almendras, who successfuly performed 30 major surgical procedures in 3 days. Three U.S. based surgeons, Drs. Julian Banzon, Florentino Lleva and Lorenz Alaan, Danao Hospital Chief Dr. Indino and Dr. Melba Arribas from Manila jointly performed around 150 minor surgical procedures, such as cyst removal, etc., performing the procedures at a corner of the hospital building, under a very hot and humid condition. For the first time consultations and medicine dispensing which used to be done right at the Danao District Hospital compound, had been moved to the newly renovated and air-conditioned Danao City Civic Center. The move was hailed by medical volunteers, patients as well as by hosptial staff as it lessened the crowd at the hospital. 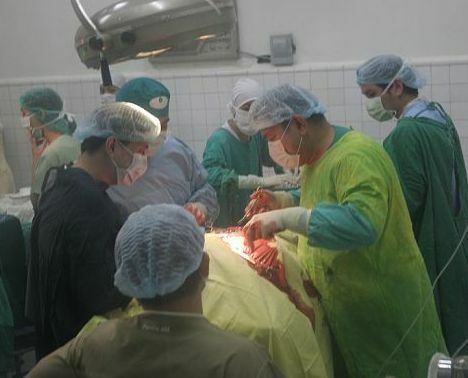 Only patients scheduled for minor and major surgeries were entertained at the hospital and all the rest were comfortably seated, waiting their turn at the air-conditioned Civic Center. 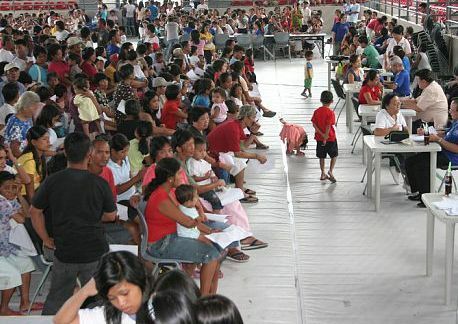 As usual over 2000 indigent Danawanons were seen by doctor volunteers at the Civic Center, received their needed medications and some multi-vitamins that were contributed by well-meaning DAUSA members and supporters. Aside from medicines and medical supples provided by DAUSA’s regular donors, IMA World Health of New Windsor, Maryland and Americares of Stamford, Connecticut, the City Government of Danao through the City Health Office also provided several boxes of medicines to meet the needs of people seeking help during the 3-day medical mission. IMA has been assisting the DAUSA Medical Mission since 1999, and Americares since 2002. The Free Dental Clinic with a 6-seater Mobile Dental Van provided by the City of Cebu was also moved outside the Civic Center and listed over 300 people getting dentral extractions, free tootpaste and medicines. Around 20 DAUSA Members and officers led by Dr. Anita Cal-Jackson actively did their share in making DAUSA’s commitment to help the city’s poor get the medical assistance they badly need a huge success. The DAUSA Medical Mission has always been a big success, since it started in 1998, has become an institution and eagely awaited by many people who cannot afford to go to Cebu City for treatment, especially those needing surgical interventions. The 2008 Karansa sa Danao has drawn a record breaking crowd since it started nearly 30 years ago. To my rough estimate, those who watched, in the streets around the parade route and those at the reclaimed area of the Fish Port, could be no less than 200,000. Among the crowd were a big contingent from the U.S. mostly members of DAUSA who came along with the Balik Danao group and/or with the DAUSA Medical Mission vountteers. Click the link below to see photos of the 2008 Karansa sa Danao.